Posted on August 25, 2012	by Ray V.
Much of what we do at the funeral homes change on a regular basis. Some changes are driven by us and some by our customers. One of the changes we have seen over the past few years is people selecting cremation for their self or family members. This changes the dynamic a bit as after the funeral, (if there is one), we used to go in procession to the cemetery for the “final” part of the funeral. Today we often take the remains to the crematory, perform the cremation and then make arrangements for a family member to come and take possession of the urn, (if it is not to be buried). I suppose, even though we try to be sensitive, it can be a little awkward for family members to come to take the urn. Thinking about it, I recalled that a few years ago, we started displaying the urn in a small, sitting room and ushered the family member into the room. They got to spend a few minutes alone and then they could take the urn and go home. For some unknown reason, we had stopped doing that…..until yesterday. 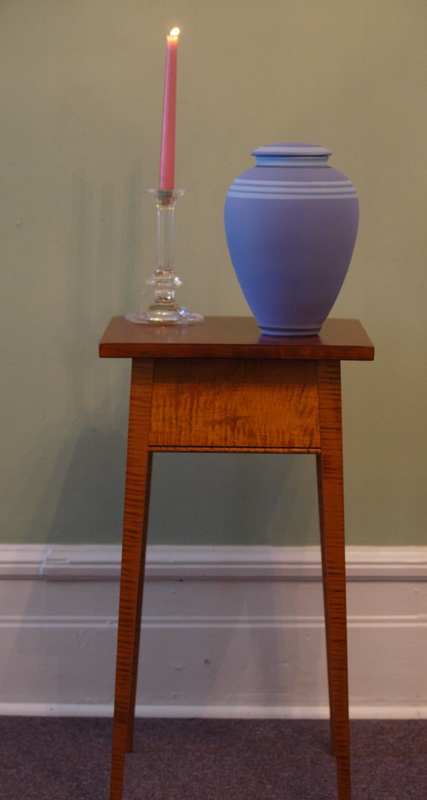 One of my regular, daily reads is the blog of a furniture craftsman from Maine. The blog is entitled Sippican Cottage and last week, they advertised discounted prices on some stock items. I clicked on the link and found a piece that would be perfect for our urn presentations….and shipping was free! The stand arrived yesterday. (it was securely packaged in such a way that it would need to be run over by a truck to get damaged). It took longer to un-package the stand than it did to order it. I like attention to detail. For those of you who are a little nervous, the urn in the picture is from inventory and is empty. This is a beautiful piece and is perfect for the intended use. I am confidant that Greg will be proud to add another “use” (cremation urn stand) for his furniture catalogue. This entry was posted in A New Use and tagged Aiken Bloggers, Aiken Funeral Home, Aiken SC, Cremation, Cremation furniture, cremation urn, furniture craftsman, George Funeral Home, George Funeral Home & Cremation Center., Ray Visotski, SC Cremation & Burial Society, Sippican Cottage, urn presentation, Veterans Funeral Care. Bookmark the permalink. Win-Wins are always winners. Wonderful. E.